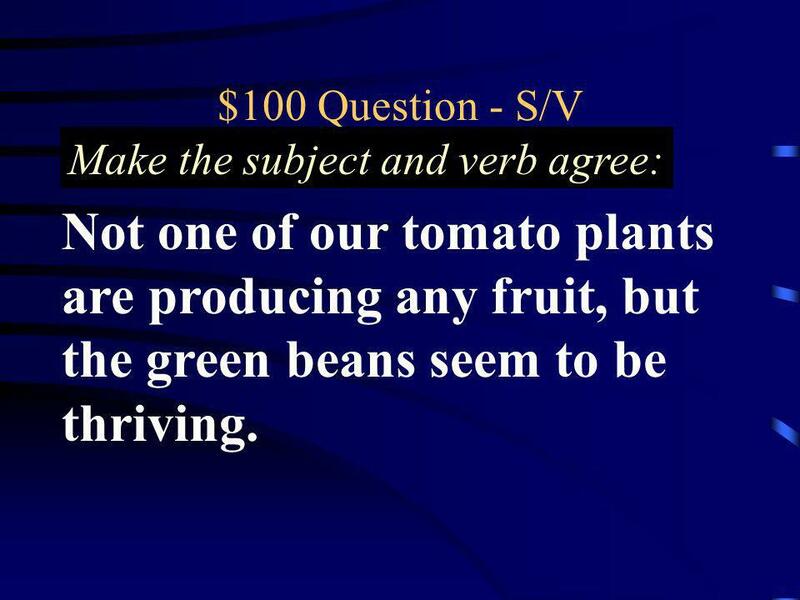 2 $100 Question - S/V Make the subject and verb agree: Not one of our tomato plants are producing any fruit, but the green beans seem to be thriving. 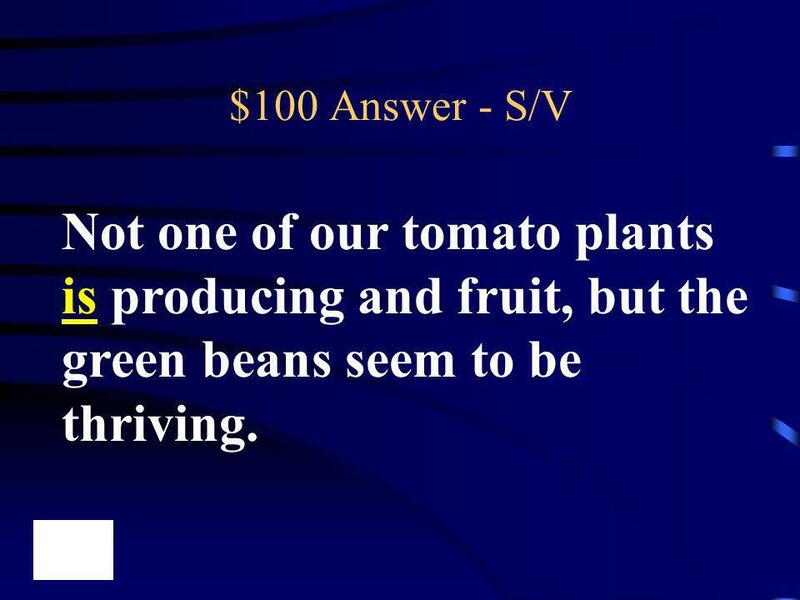 3 $100 Answer - S/V Not one of our tomato plants is producing and fruit, but the green beans seem to be thriving. 4 There is a brush, a comb, and a mirror on the dresser top. 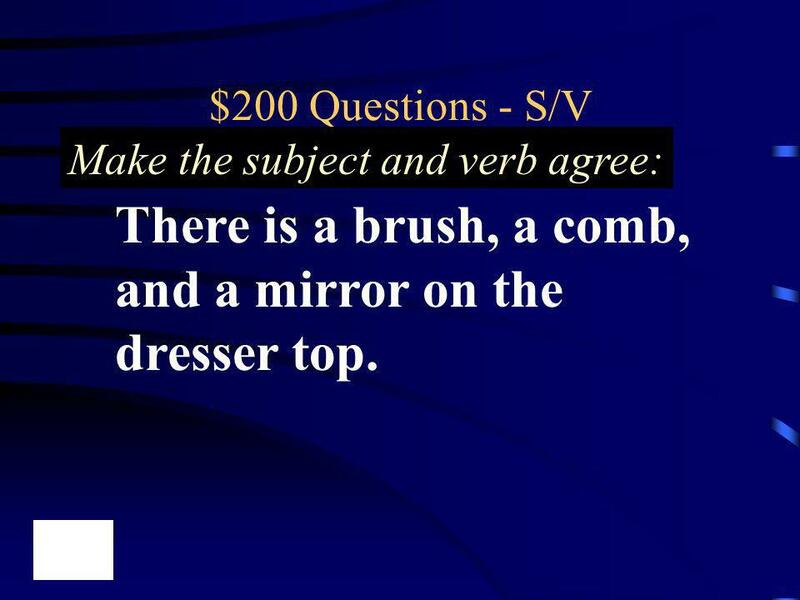 $200 Questions - S/V Make the subject and verb agree: There is a brush, a comb, and a mirror on the dresser top. 5 There are a brush, a comb, and a mirror on the dresser top. $200 Answer - S/V There are a brush, a comb, and a mirror on the dresser top. 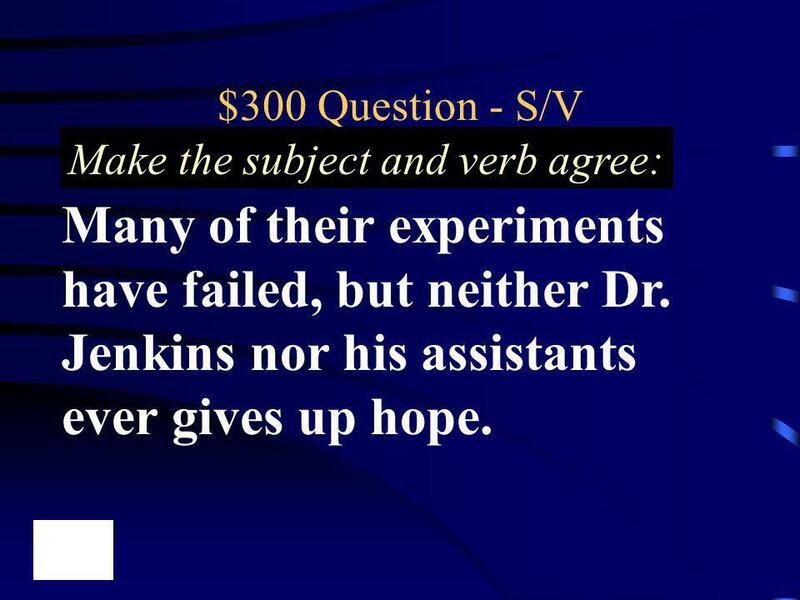 6 $300 Question - S/V Make the subject and verb agree: Many of their experiments have failed, but neither Dr. Jenkins nor his assistants ever gives up hope. 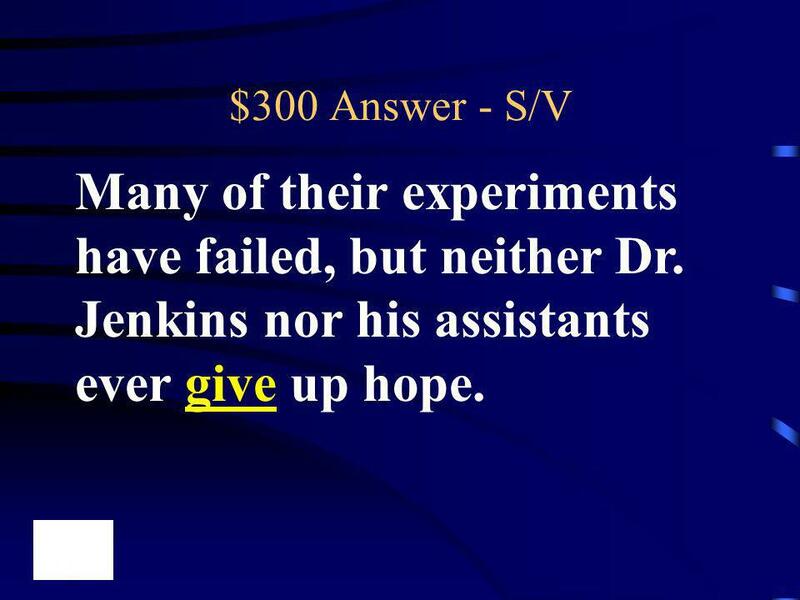 7 $300 Answer - S/V Many of their experiments have failed, but neither Dr. Jenkins nor his assistants ever give up hope. 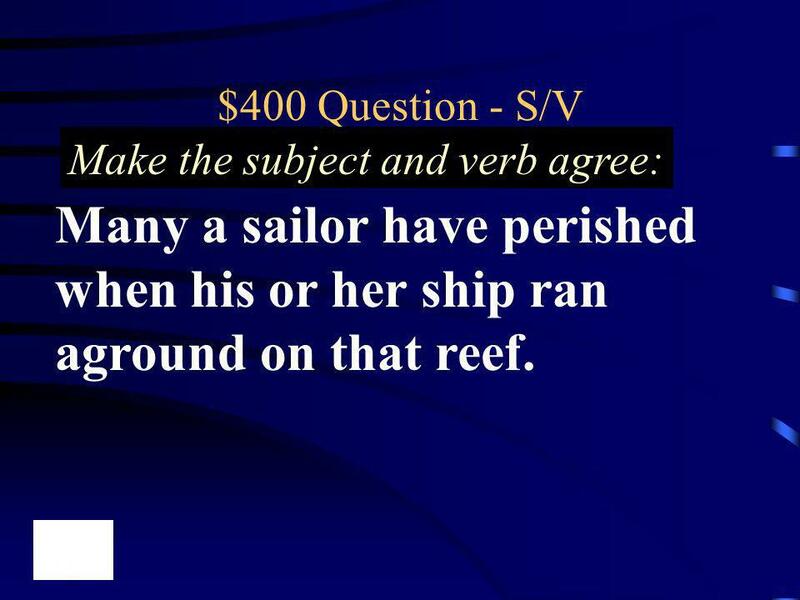 8 $400 Question - S/V Make the subject and verb agree: Many a sailor have perished when his or her ship ran aground on that reef. 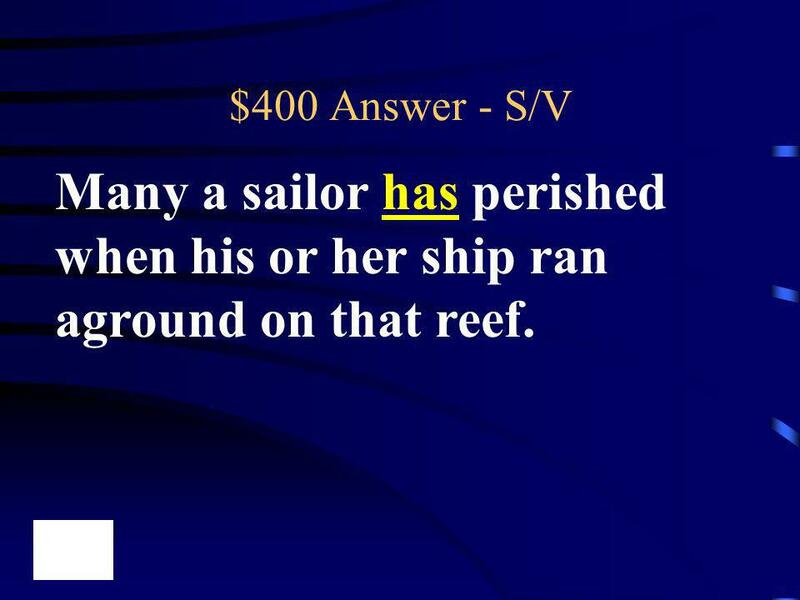 9 $400 Answer - S/V Many a sailor has perished when his or her ship ran aground on that reef. 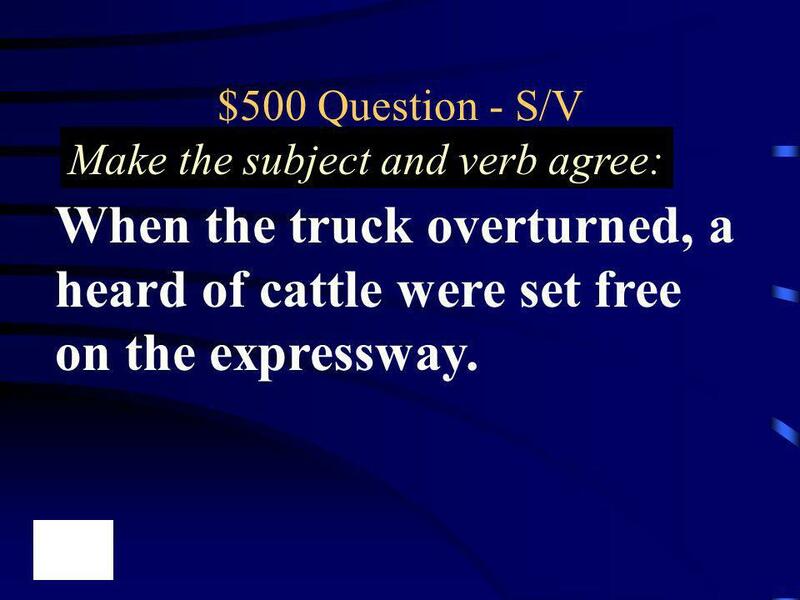 10 $500 Question - S/V Make the subject and verb agree: When the truck overturned, a heard of cattle were set free on the expressway. 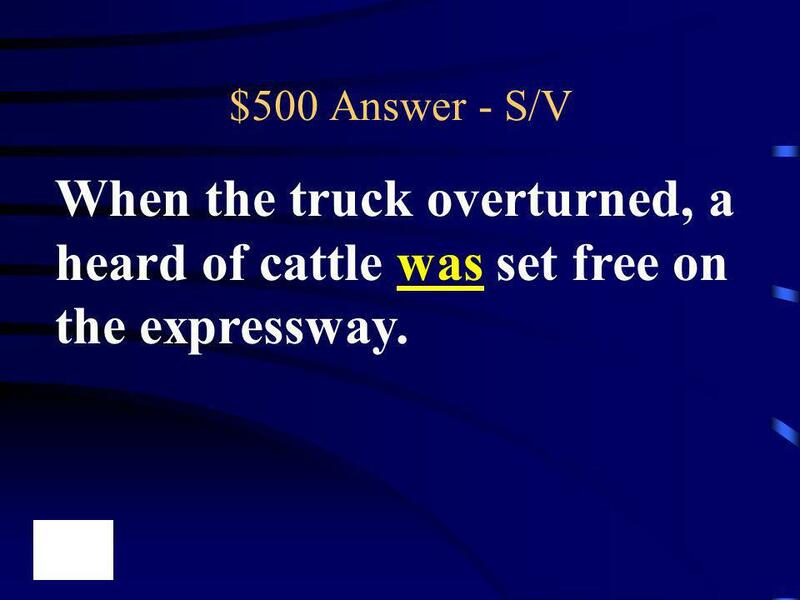 11 $500 Answer - S/V When the truck overturned, a heard of cattle was set free on the expressway. 12 The teacher reminded everyone to sharpen their pencil. 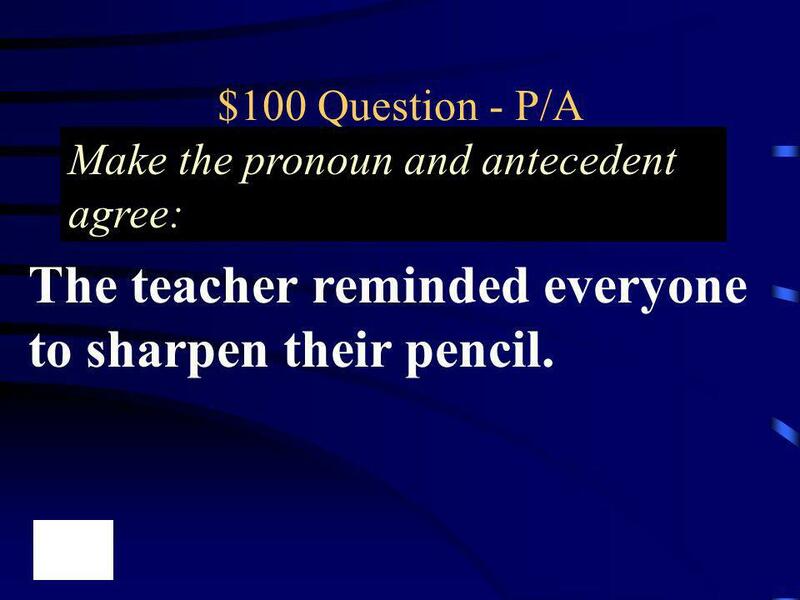 $100 Question - P/A Make the pronoun and antecedent agree: The teacher reminded everyone to sharpen their pencil. 13 The teacher reminded everyone to sharpen his or her pencil. 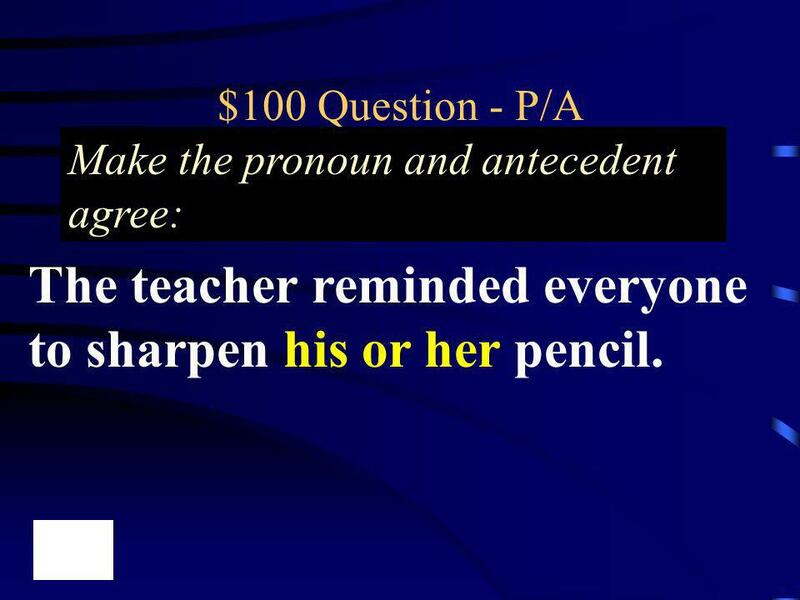 $100 Question - P/A Make the pronoun and antecedent agree: The teacher reminded everyone to sharpen his or her pencil. 14 Has each of the girls memorized their part? 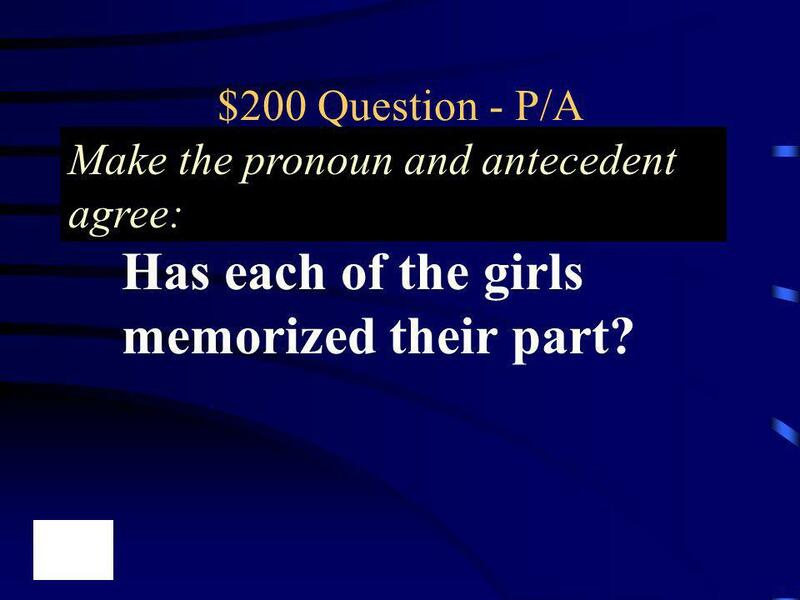 $200 Question - P/A Make the pronoun and antecedent agree: Has each of the girls memorized their part? 15 Has each of the girls memorized her part? $200 Answer - P/A Has each of the girls memorized her part? 16 Both of the finalists played his or her best. 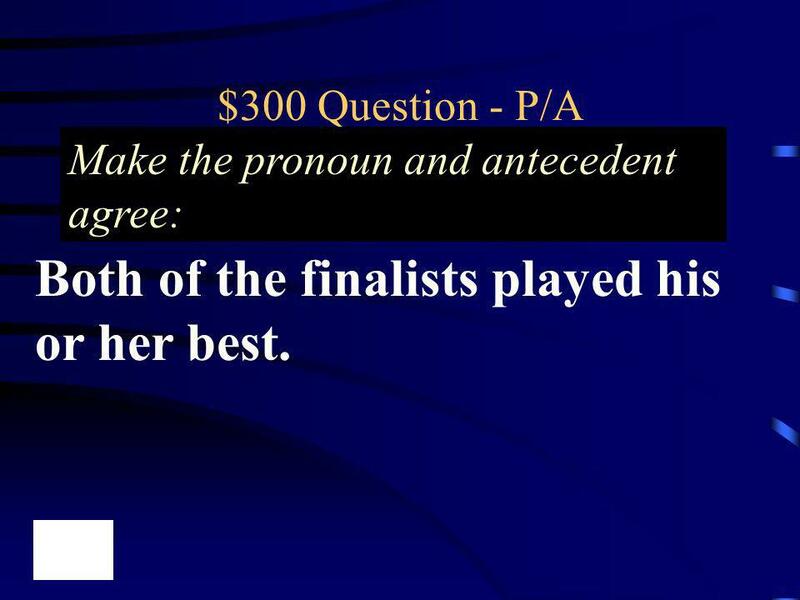 $300 Question - P/A Make the pronoun and antecedent agree: Both of the finalists played his or her best. 17 Both of the finalists played their best. 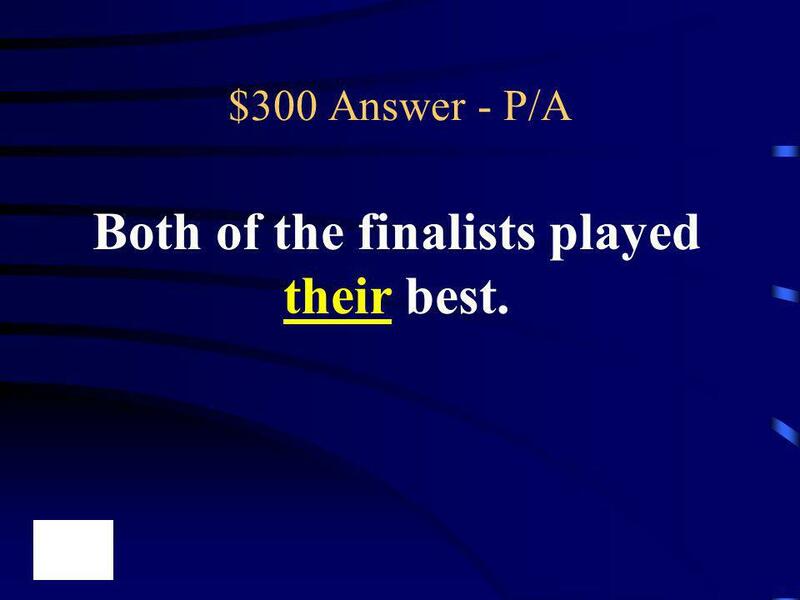 $300 Answer - P/A Both of the finalists played their best. 18 Read Little Women and write a plot summary about them. 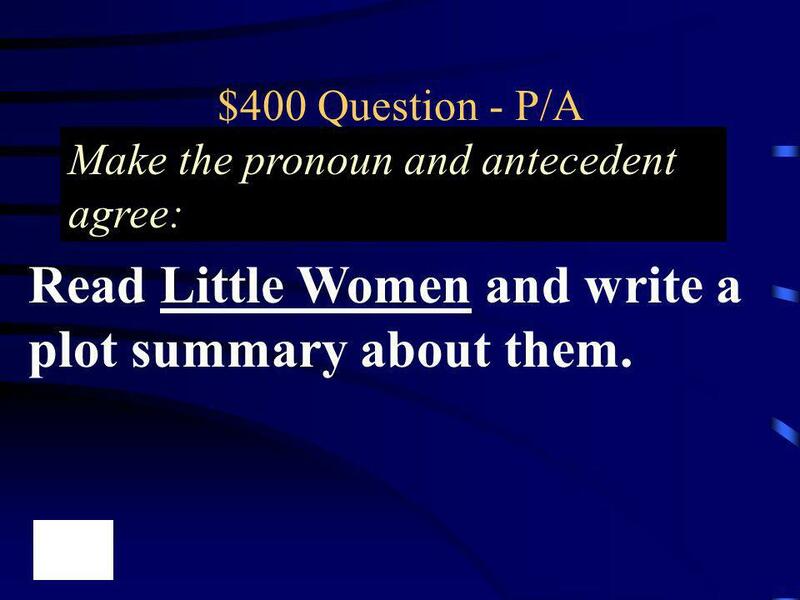 $400 Question - P/A Make the pronoun and antecedent agree: Read Little Women and write a plot summary about them. 19 Read Little Women and write a plot summary about it. 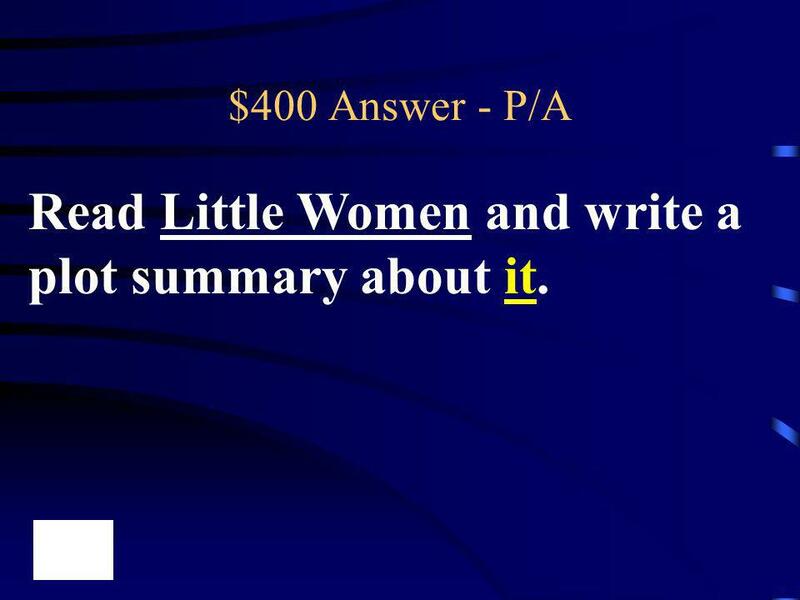 $400 Answer - P/A Read Little Women and write a plot summary about it. 20 Every passenger will be shown where to put their luggage. 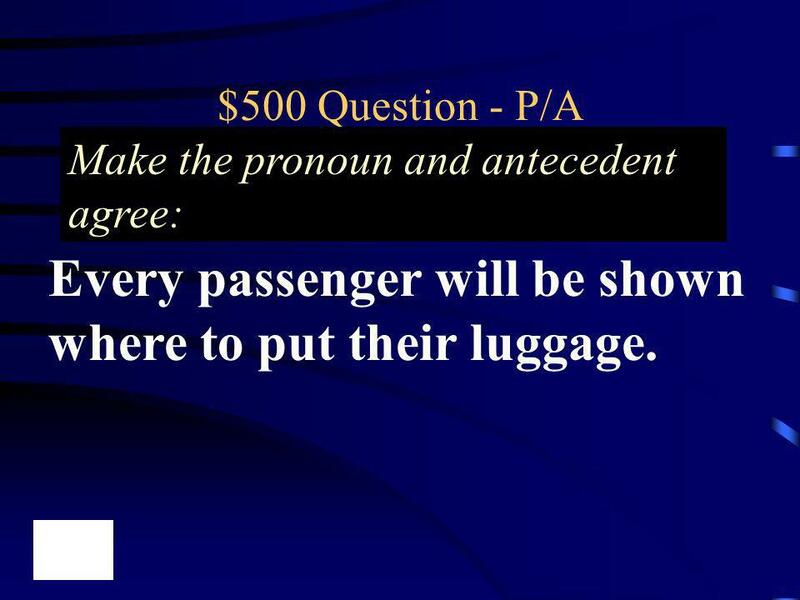 $500 Question - P/A Make the pronoun and antecedent agree: Every passenger will be shown where to put their luggage. 21 Every passenger will be shown where to put his or her luggage. 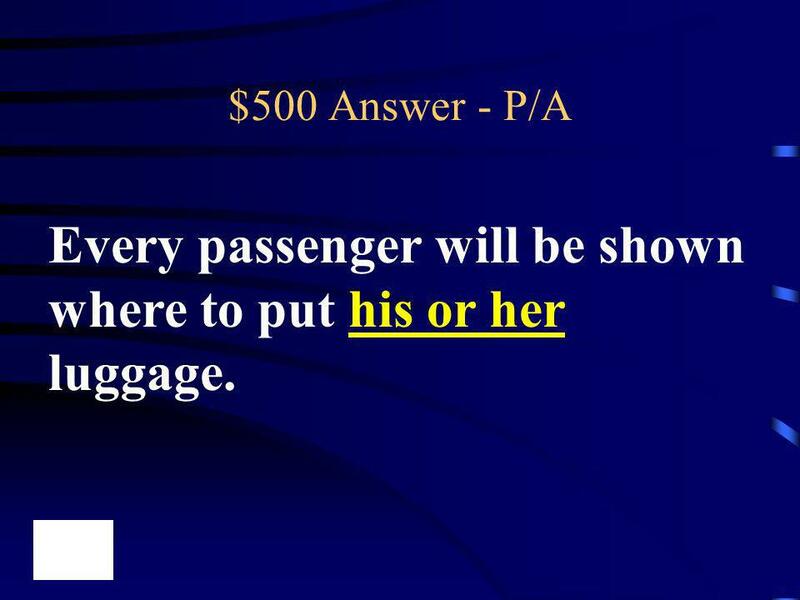 $500 Answer - P/A Every passenger will be shown where to put his or her luggage. 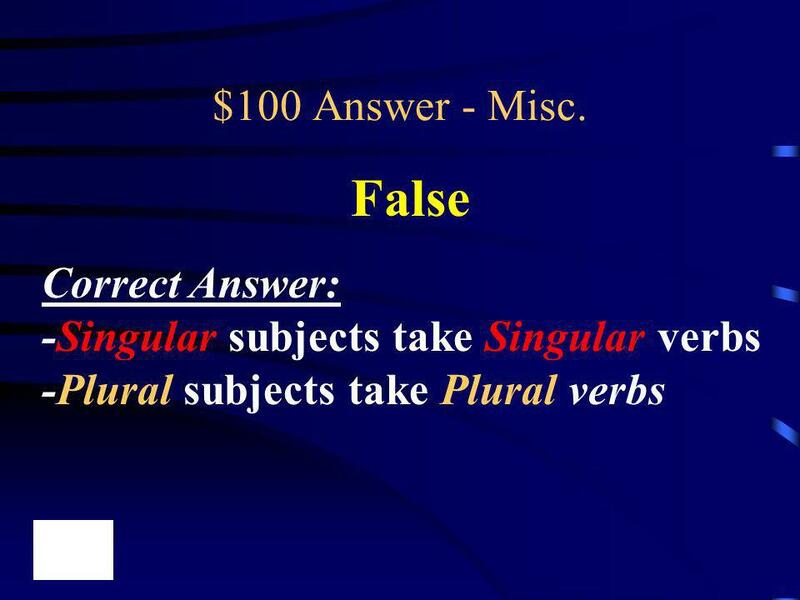 22 True or False: $100 Question - Misc. 26 $300 Question - Misc. 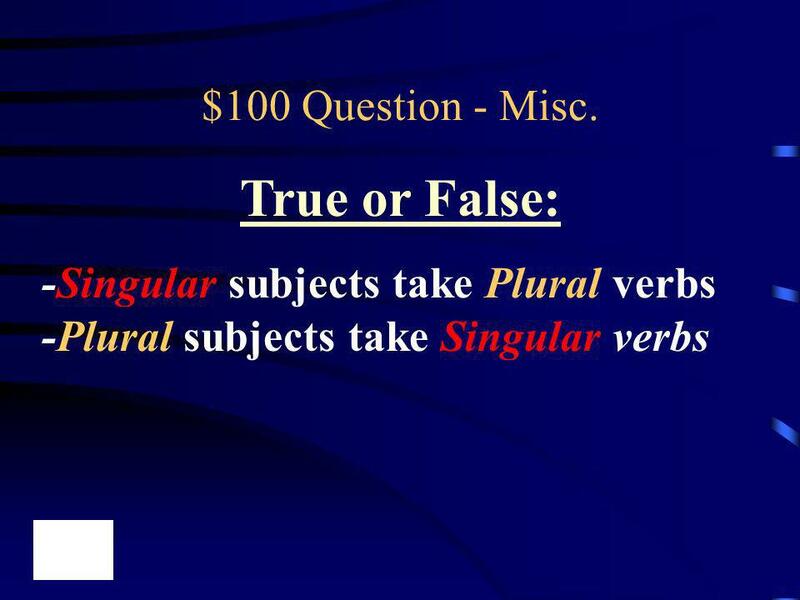 If you have two singular subjects joined by “and” would the verb be singular or plural? 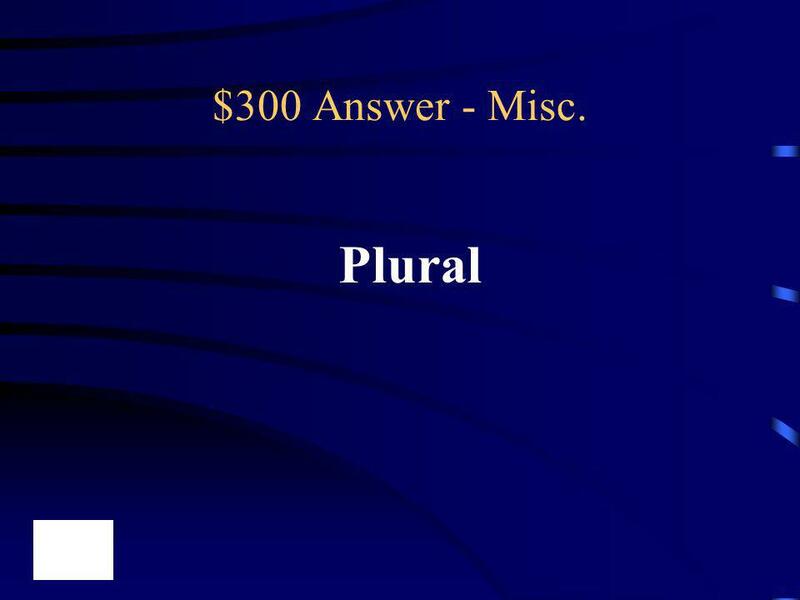 28 Which of the following are singular and which are plural? 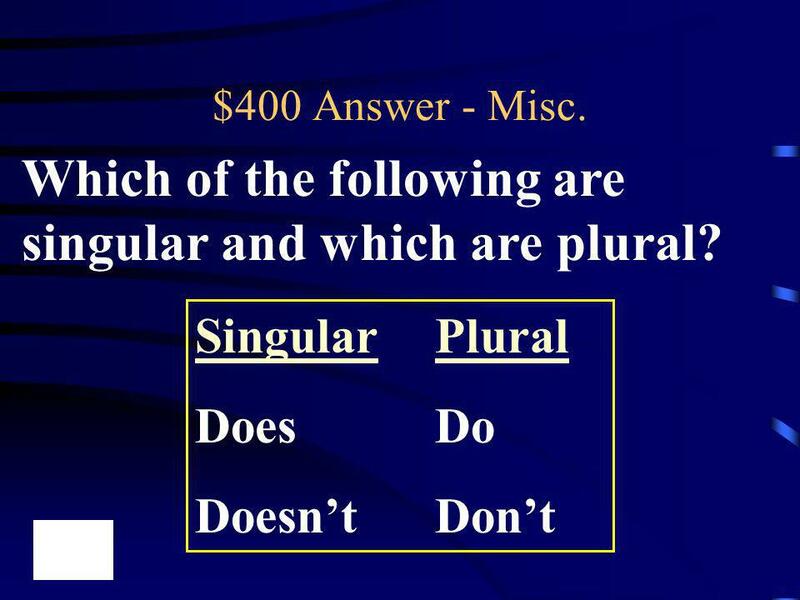 29 Which of the following are singular and which are plural? 30 My mom told me Of Mice and Men was on my summer reading list. $500 Question - Misc. 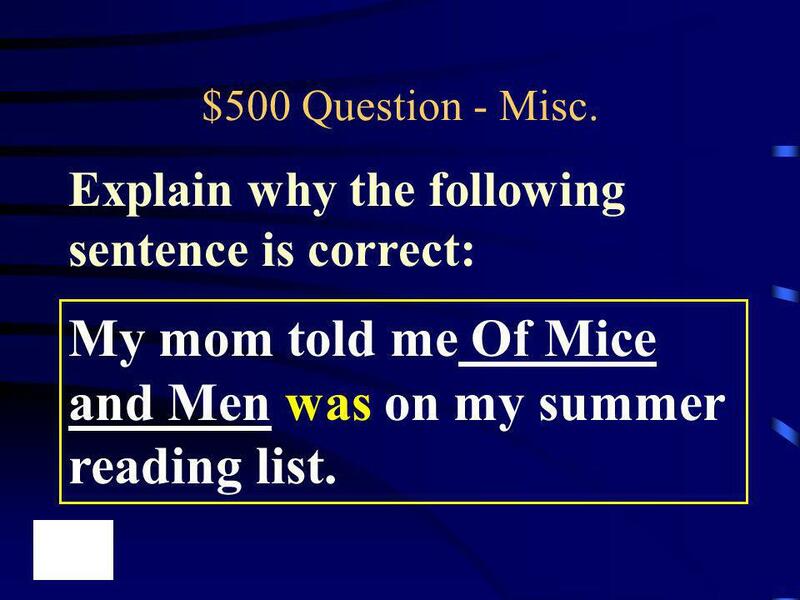 Explain why the following sentence is correct: My mom told me Of Mice and Men was on my summer reading list. 31 My mom told me Of Mice and Men was on my summer reading list. $500 Answer - Misc. 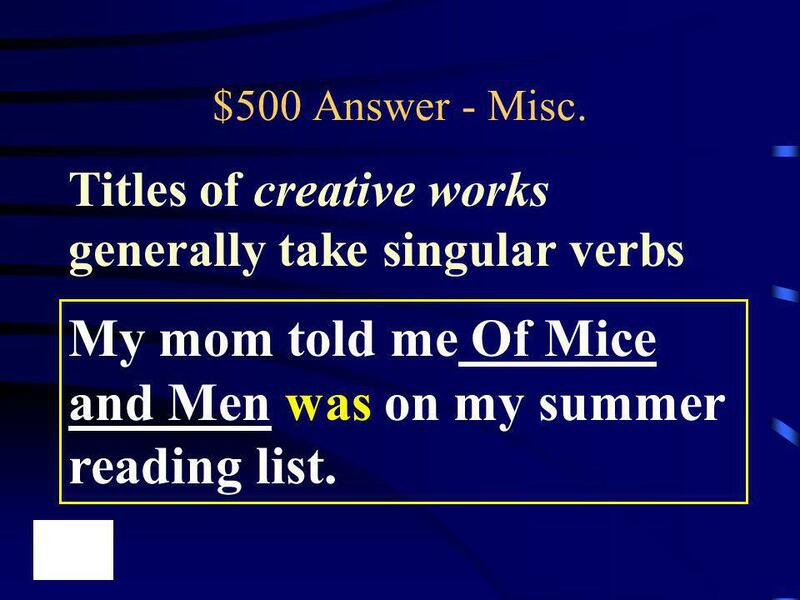 Titles of creative works generally take singular verbs My mom told me Of Mice and Men was on my summer reading list. 32 Name at least five different indefinite pronouns. 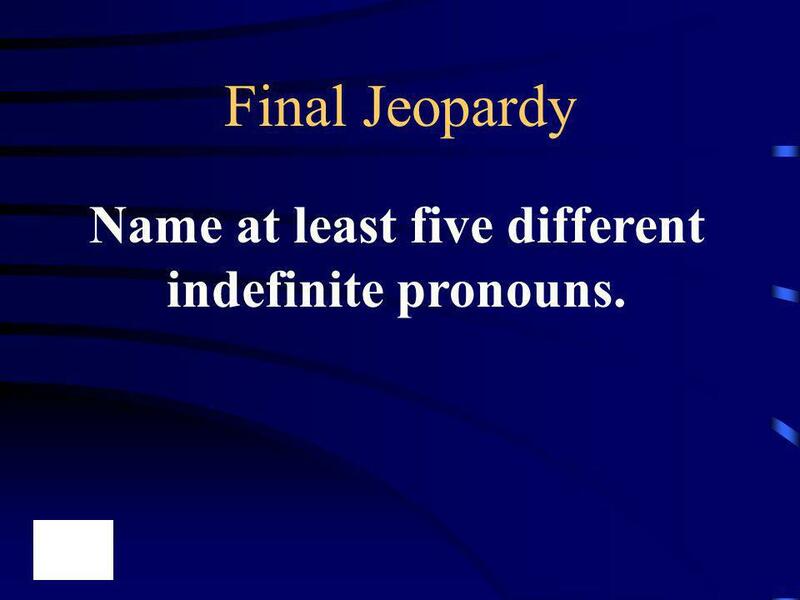 Final Jeopardy Name at least five different indefinite pronouns. 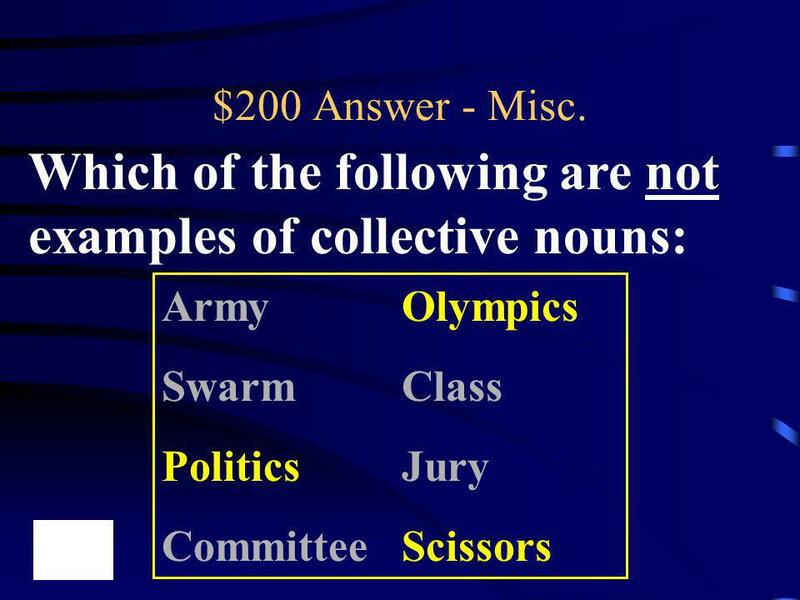 Download ppt "Jeopardy Q $100 Q $100 Q $100 Q $200 Q $200 Q $200 Q $300 Q $300"
Agreement and Indefinites. 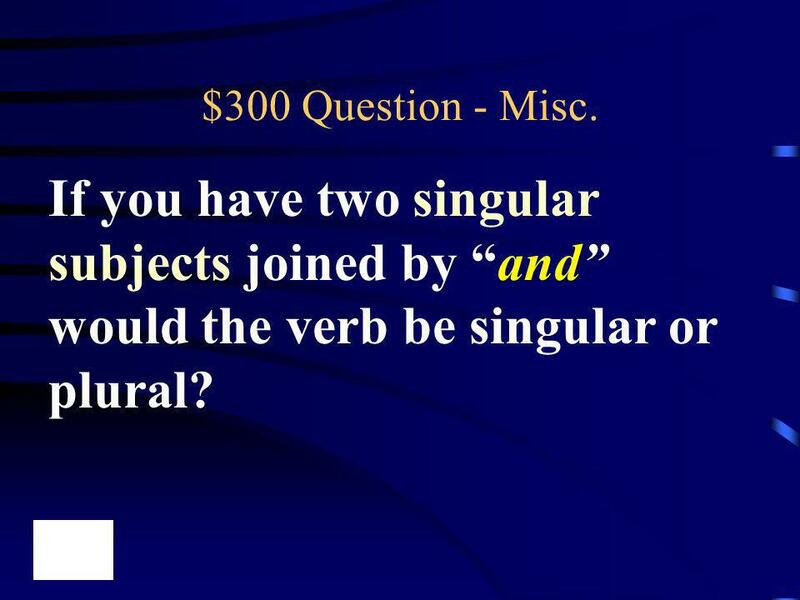  Pronouns should agree with the antecedent in number, case and gender  That is if there is one person you use the singular. Indefinite pronouns Click for next slide. Indefinite Pronouns LC 1.2 Students should be able to identify and correctly use indefinite pronouns. 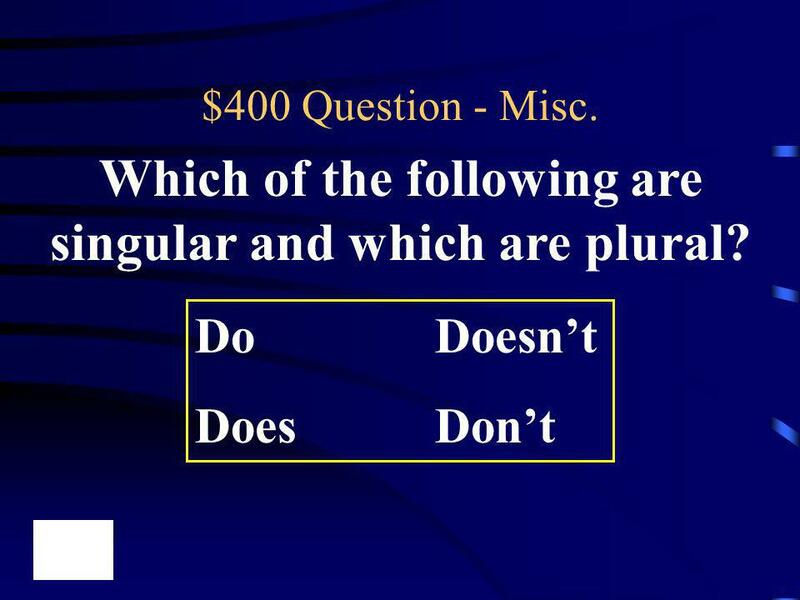 Some indefinite pronouns are singular, some are plural, and some can be singular or plural, depending on how they are used. 1.The following indefinite. A pronoun is a word that takes the place of one or more nouns. Pro- means for (standing FOR a noun) yg9MKQ1OYCg. 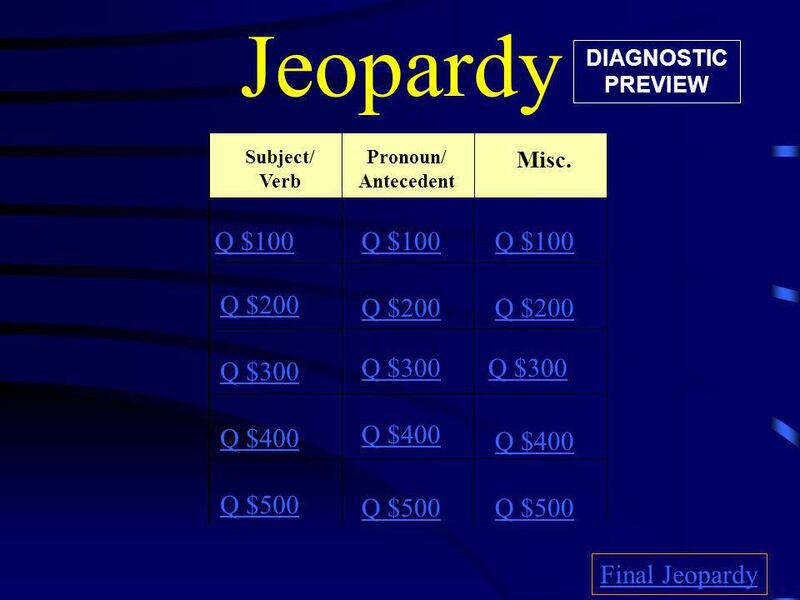 Pronouns and Antecedents. 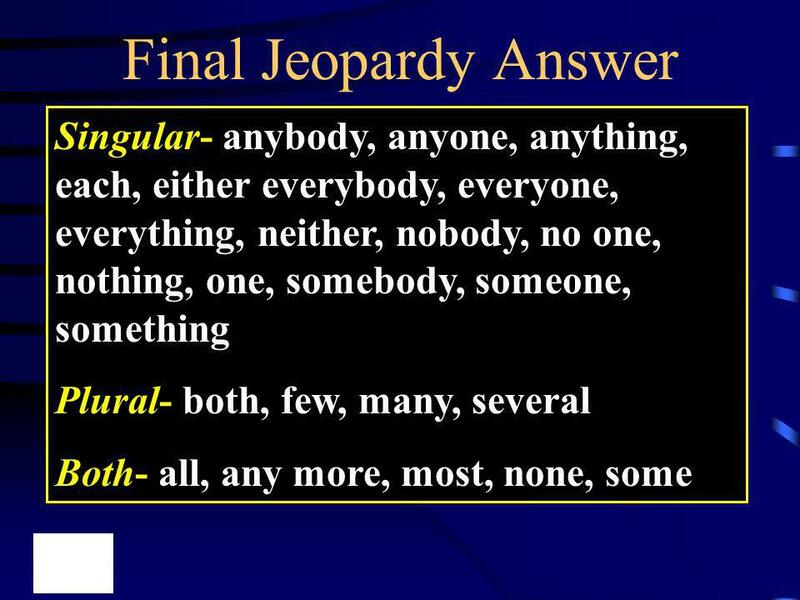 A pronoun must agree with its antecedent in three ways: Person (1 st, 2 nd or 3 rd ). Number is the quality that distinguishes. What is an indefinite Pronoun? It is a pronoun that does not refer to a specific person, place or thing. Using Indefinite Pronouns Using Indefinite Pronouns.